With the iPad Mini finally on the market, one of Apple's biggest concerns is the cannibalization impact on the sales of larger iPads (4th generation iPad & iPad 2). Most analysts have estimated that cannibalization would fall in the 15-20% range, i.e. 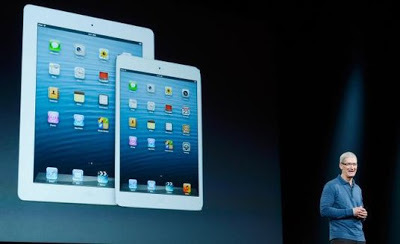 15-20% of iPad Mini sales would be at the expense of larger iPads. Let's take a look at how realistic these estimates are. The best way to estimate iPad Mini-related cannibalization would be to take a look at the impact of the iPad 2 (starting at $399) on 3rd generation iPad sales (starting at $499). Unfortunately, measuring that impact has always been a problem since Apple does not release sales by iPad model. This is where patent litigation comes to our rescue. During the Apple vs. Samsung trial, the companies were forced to reveal US sales figures of accused products until Q2 2012, which included the iPad 2 and AT&T's 3G-enabled, first generation iPad or iPad (AT&T), but excluded the 3rd generation iPad. Since the 3rd generation iPad was launched in the last week of Q1 2012, we have Q2 2012 US sales figures for all non-3rd generation iPads. This gives us some great data to start with, so let's dive in. iPad (AT&T) - In Q2 2012, the original iPad (AT&T) would have been handicapped by limited distribution & marketing, compared to the two newer iPad models in the market. Therefore, we can safely assume that this product comprised a maximum of 15% of the sales revealed during the trial. iPad 2 - US iPad 2 sales would be the difference of the Q2 2012 figures revealed during the trial and the estimated sales for the iPad (AT&T) above. 3rd Generation iPad - In order to estimate the number of 3rd generation iPad sales in the US, we need to estimate total iPad sales in the US and deduct the sales figures revealed during the trial. Based on the trial data, US iPad sales have formed between 35-45% of global iPad sales for the past five quarters. The proportion of US sales seems to peak (at ~45%) during the first full quarter after a product launch. Since Q2 2012 meets those requirements, we can assume that US iPad sales formed 45% of global Q2 2012 iPad sales (17 million). The figures above show that the iPad 2 was the most popular iPad model, with more than 60% of total sales volume in the US and more than 70% of iPad sales excluding the iPad (AT&T). But this does not mean that the iPad 2 cannibalized 70% of 3rd gen iPad sales. 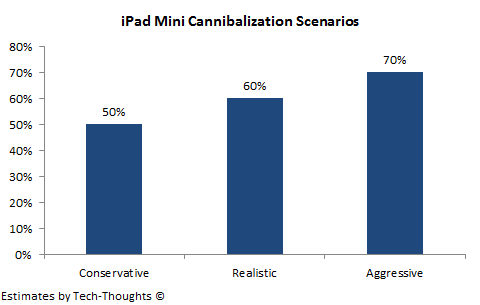 Cannibalization is a measure of the proportion of consumers that bought the iPad 2 instead of the 3rd generation iPad. The current figures also include consumers who may have never considered a 3rd generation iPad, but bought the iPad 2 because of its lower price tag. In order to segregate these two classes of consumers, we need to compare the above figures with the hypothetical sales of the 3rd generation iPad in the absence of a cheaper iPad 2. The chart above shows that the iPad 2 cannibalized approximately 60% of 3rd generation iPad sales, i.e. for every 5 million iPad 2 buyers, Apple lost 3 million 3rd generation iPad buyers and therefore, gained a net of 2 million iPad users. This is also consistent with the sharp QoQ drop in the iPad's average selling price in Q2 2012. While this estimate is based on US sales in Q2 2012, long-term cannibalization in the global market is unlikely to be very different. Cannibalization in the US market could have been higher than normal in the launch quarter, due to pent up demand at lower price points. However, this should be balanced out on a global scale, by the lower purchasing power of non-US consumers. Now that we have estimated the cannibalization impact of the iPad 2, it becomes far easier to understand the same for the iPad Mini. The cannibalization impact of the iPad 2 was primarily driven by the fact that it was priced $100 lower than the 3rd generation iPad. Now we have two levels of cannibalization, with an iPad Mini priced $70 lower than the iPad 2 and $170 lower than the 4th generation iPad. In addition to this, the iPad Mini is also available in far more storage options and configurations as compared to the iPad 2. Based on the points above, even though the iPad Mini is a smaller tablet, the cannibalization impact is unlikely to be far lower than it was for the iPad 2. In fact, it is quite possible for cannibalization to be at the same level as the segmentation analysis suggests that many price-sensitive buyers are unlikely to form a significant proportion of sales. However, since the iPad Mini is priced $70 lower than the previous starting price, it is likely to draw more first time (price sensitive) buyers than previous versions. Based on this analysis, I would expect the iPad Mini to cannibalize at least 50% of iPad sales, i.e. for every 5 million iPad Minis sold, Apple would lose at least 2.5 million iPad buyers and gain at most 2.5 million iPad users. You are working off a false premise. 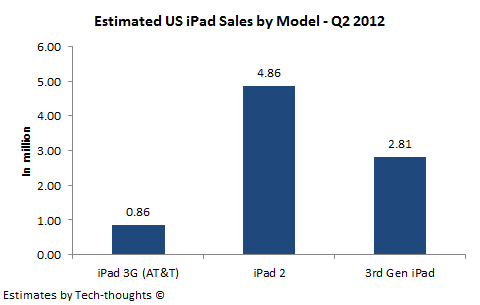 I believe the US sales chart you cite from the Samsung Trial (5.7 million in Q2 2012) does not exclude US iPad3 sales. The footnote cites only the wireless iPad and ipad2 as accused devices, but the sales chart is more comprehensive. The iPhone sales numbers certainly include 4S sales, even though that model is not listed in the footnote as accused (No way Apple has the Q4 2011 iPhone sales figures shown without 4S). In Q2 2012, there would not have been any original iPad sales (it was discontinued with the launch of ipad2 13 months prior). If you calculate US iPad ASP from the chart, you get $506 for Q2 2012, which cannot be achieved with a single iPad2 model priced at $399. The iPad 3 had to be included in the mix. 1. The court asked Apple/Samsung to reveal revenue from the sale of accused products, so damages could be calculated in case infringement was proved. Including revenue of non-accused products would artificially inflate damages Apple would have had to pay. In fact, if those were included, someone would've been fired by now (not Scott Forstall). 2. AT&T still sold the OG iPad in Q2 2012. These could've been leftover inventory, but in that case iPad 2 cannibalization would be higher, not lower. 3. If the sales chart includes the iPad 3, that means iPad sales crashed in the US, taking into account cyclicality. Just 28% QoQ growth is unthinkable in a product launch quarter. It also means the US % of global iPad sales crashed to 34%, which is completely inconsistent with the data we know. 4. The iPad 2 also had a 3G version available for $529, it is entirely possible that this was the more popular model in the launch quarter. More importantly, Apple's declared revenue always includes sales of iPad accessories. It is unclear if this figure is included in the data mandated. This is why you never look at ASP in isolation, but in a trend. According to the court figures, the iPad's ASP fell by about $100 from Q2 2011 to Q2 2012. Based on this, I think it's very unlikely that the data included non-accused products. 1) The top part of the graph is entitled "Apple's US Historical iPhone, iPad, and iPod Touch Sales," and makes no claim to be a listing of accused products. The bottom part of the graph breaks down the revenue and units sales of accused products, and discrepancies indicate that these data are a subset of the figures above it. To this point, under footnote 1, the iPhone 4S is not included as an accused product (it, like the cellular-equipped iPad 3, has a Qualcomm chip, which appears to come with pass-through rights to Samsung IPR). Yet in the top part of the graph, under the sales for Q4 2011, Apple indicates sales of 15 million iPhones in the US, in a quarter in which they sold 37 million iPhones globally. This was the launch quarter for the 4S, during which the accused phones alone could not have accounted for a 212% QoQ growth in the US. In fact, 15 million is already more than the number of iPhone activations AT&T (7.2 million), Verizon (4.4 million) and Sprint (2 million) reported for that quarter, and we know those numbers are comprehensive (ie, included the 4S). 2) AT&T might have had leftover inventory of the original iPad in Q2 2012 (then 2 years after launch and 1 year after Apple officially discontinued it), but those would not be listed here, as Apple books revenue on shipment. 3) iPad 3 launched in March 16 in Q1 2012, so that would would temper the sequential growth from Q1 to Q2. Part of the Q1 shipment numbers of 12 million units were the 3 million iPad 3 sold opening weekend. Surely, the 4.46 million US units shipped that quarter already includes the contribution from iPad 3? Otherwise US sales would have accounted for more than half of the global sales. As for the lower US share in Q2, iPad 3 sell in was expanded very rapidly across the globe (the "fastest product rollout to date"), so the lower US contribution doesn't surprise me. 4) Yes, the fall in ASP of $100 is clearly indicative of iPad2's discounted price. That we can agree on, and the $400 iPad2's effect on ASP (either sequentially or YoY) is probably sufficient to calculate the product mix. All good points. I have to admit, the iPhone data looks a little inconsistent. The individual data points in the footnote are definitely a subset of the sales data, but not all products infringe each patent. The iPad 3 launched on March 16th, but it doesn't make sense that the launch only tempered the Q1-Q2 growth in the US, and not globally, especially considering the rapid rollout. But your point on US vs. global Q1 shipments is valid. But overall, I'm still skeptical that Apple would reveal sales of non-accused devices during a patent trial. But we may need to dig up some more data to verify the cannibalization figures. The drop in ASP is telling, but I don't think ASPs would be sufficient to calculate the product mix / cannibalization by themselves because the split between configurations/storage options is still unknown. The introduction of a cheaper iPad 2 would also have skewed the sales mix of the iPad 3 as well, as opposed to the previous launch. I think the Q4 sales figures and ASP will shed some more light on this topic.